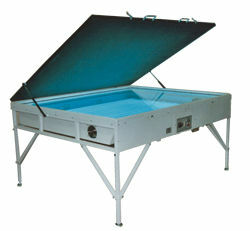 The screen exposure unit can be used for complete stencil making on screen printing frames. For setting the stencil a yellow lamp is mounted under the glass surface. The light source is a metal-halide lamp complete with rotating shutter blades. The exposure is controlled by a timer. 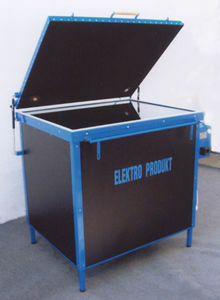 The unit is fitted with rubber blanket and with a vacuum pump.